The Southern Arizona Travel Guide is a resource for those planning a road trip or vacation to the region. The southern half of Arizona, including the metropolitan Phoenix and Tucson areas, is within the Sonoran Desert. 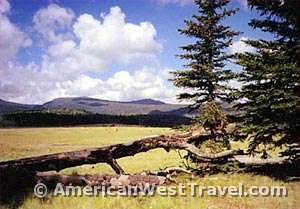 The Mogollon Rim and White Mountains stretch across the central and eastern part of Arizona. When the desert region becomes extremely warm during the summer, the Rim Country's high elevation and lush forests offer desert dwellers a cool escape from the summer heat. The White Mountains also feature snow skiing and other winter sports. The higher elevations - above 8,500 feet - in far eastern Arizona offer a true alpine experience with plentiful camping, hiking trails and lakes and streams for fishing. The Coronado Trail is one of the state's finest scenic drives. This guide offers descriptions of many points of interest, links to many references, travel itineraries, and suggested visit times. See below for White Mountains and Mogollon Rim Points of Interest and the complete Index for this guide. The Mogollon Rim is a rugged escarpment, a high plateau with elevation generally over 7,000 feet which runs across two thirds of central Arizona into New Mexico. It is a region of heavily wooded forests and high country lakes. The Rim sometimes drops precipitously over 2,000 feet to the desert below, offering spectacular vistas. The Rim Lakes Recreation Area offers some of the state's finest fishing, camping, hiking, horseback trails, and scenic views. Only 90 minutes from Phoenix, it is indeed a popular summer destination for desert dwellers. The center of activity is Bear Canyon, Woods Canyon, and Willow Springs Lakes and its numerous nearby campgrounds. Also, at-large camping is permitted in designated areas of the national forest. Forest Road 300 is the main road through the area. It parallels the General Crook Trail and the edge of the Rim, with some exciting vista points. Location: Take AZ-87 north from Phoenix to Payson, then AZ-260 east. FR-300 leaves AZ-260 just after it climbs to the top of the Rim. Time: A long day trip, a weekend, or more. Black Mesa Ranger District - Western most district of Apache-Sitgreaves National Forests. Recreational Activities on the Mogollon Rim area. Boating - at Black Canyon, Chevelon Canyon, Sardine, Spillway, and Woods Canyon. Camping - at Aspen, Black Canyon, Canyon Point, Chevelon Canyon, Crook, Gentry, Mogollon, Rim, Sinkhole, and Spillway. Fishing - at Bear Canyon, Willow Springs, and Woods Canyon Lake. Hiking - Listing of many good trails within the Mogollon Rim area. Mogollon Rim Ranger District - The Mogollon Rim District Recreation Areas includes campgrounds, trails, hiking in wilderness areas, boating and fishing in lakes and streams, enjoying scenic drives and rock climbing areas. Includes details on Knoll Lake, Blue Ridge Reservoir, Kehl Springs, Clints Well, Blue Ridge, Rock Crossing, Jack's Canyon Camping and Climbing Area, and the Rim Road/General Crook Trail Loop. Arizona Game and Fish Department - Information on where to buy fishing and hunting licenses, current regulations, where to view wildlife, and other outdoor recreation. The towns of Pinetop - Lakeside are the gateway to the White Mountains of eastern Arizona. The mountains rise several thousand feet above the Mogollon Rim and offer even cooler summer weather. Winter sports are also available in the mountains. Recreation is available in the Apache-Sitgreaves National Forest and the Fort Apache Reservation. 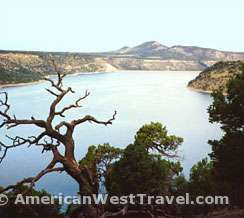 The Fool Hollow Lake Recreation Area outside the nearby town of Show Low offers especially nice camping, boating, and fishing. The campground is well-suited to RVs, with paved sites and hookups. A wide variety of lodging is available in the Pinetop-Lakeside area, ranging from cabins to bed and breakfasts to conventional motels. Lakeside Ranger District - Located approximately in the center of the Apache-Sitgreaves National Forests next to the communities of Show Low and Pinetop-Lakeside. Boating - at Fool Hollow, Woodland Lake, and Scott Reservoir. Camping - at Fool Hollow, Lakeside, Brown Creek, Los Burros, and Scott Reservoir. Fishing - at Fool Hollow and Lakeside. Hiking - Listing of many good trails within the Pinetop-Lakeside area. The White Mountains of Arizona are a mountain range and mountainous region in the eastern part of the state, near the border with New Mexico. The White Mountains are a part of the Colorado Plateau high country of Northeast Arizona. Nearby communities include Pinetop-Lakeside, Greer, Springerville, Alpine, Eagar, and McNary. Much of the range is within the Fort Apache Indian Reservation, home to the White Mountain Apache Tribe. The part of the White Mountains outside the reservation is in the Apache-Sitgreaves National Forest. The highest summit is Mount Baldy, with an elevation of 11,400 feet (3,475 m). Its summit is on the Fort Apache Reservation and is closed to all non-tribal members. Alpine Ranger District - Located in the eastern end of Arizona's White Mountains next to the New Mexico border between the Springerville and Clifton Ranger Districts. Recreation activities centered around the communities of Alpine, and Hannagan Meadow Recreation area. Boating - Includes info on Luna Lake Recreation Area. Camping - Includes info on Alpine Divide, Blue Crossing, East Fork Recreation Area, Aspen Forest Camp, Buffalo Crossing, Deer Creek, Diamond Rock, Horse Springs, Raccoon, Hannagan Meadow Recreation Area, Hannagan, KP Cienega, Luna Lake Recreation Area, Luna Lake, and Upper Blue Campgrounds. Fishing - Includes info on Aker Lake, Hulsey Lake, and Luna Lake Recreation Area. Hiking - Listing of many good trails within the Alpine and Hannagan Meadow Recreation area. Clifton Ranger District - The Clifton Ranger District has 18 developed recreation sites and 67 trails that cover 424 miles on the district. Climate conditions can very but generally, the weather is hot and dry during the summer until monsoon moisture arrives in July and cool in the winter with temperatures being in the thirties. The Blue Range Primitive Area is located on the upper Blue River watershed and is co-managed with Alpine Ranger District. A popular attraction to the District is the Coronado Trail, a National Scenic Byway, that connects Morenci to Alpine that is very scenic with spectacular overlook views. Camping - Includes info on Black Jack, Coal Creek, Granville, Honeymoon, Lower Juan Miller, Strayhorse, and Upper Juan Miller Campgrounds. Fishing - Includes info on fishing at Honeymoon Campground. Hiking - Listing of many good trails within the Clifton Ranger District. Springerville Ranger District - Centered around the towns of Springerville and Eagar and the community of Greer in East Central Arizona on US 60 and State Highways 180/191. Elevations on the district range from 6,975 feet to 11,500 feet resulting in diverse climate and vegetation types which include pinyon-juniper, ponderosa pine, mixed conifer and spruce fir. Outdoor recreation opportunities include fishing, hiking, hunting, mountain biking, and cross-country skiing. Boating - Includes info on Big Lake, Brookchar, Bunch, Crescent Lake, Lee Valley Reservoir, Nelson Reservoir, River Reservoir, South Crescent Lake, and Tunnel Reservoir. Camping - Includes info on Apache Trout, Benny Creek, Brookchar, Cutthroat, Grayling, Rainbow, Rolfe C. Hoyer, South Fork, and Winn Campgrounds. Fishing - Includes info on fishing at Big Lake, Crescent Lake, River Reservoir, Rolfe C. Hoyer, and South Crescent Lake. Hiking - Listing of many good trails within the Springerville area. The Fort Apache Indian Reservation occupies some of the most pristine areas of the White Mountains. The White Mountain Apache Tribe offers a wide variety of outdoor recreation opportunities to visitors. The reservation's lakes and streams offer outstanding fishing. Sunrise Lake offers some of the mountains' finest trout fishing. Boat rentals are available. Hawley Lake has fishing, camping, boat rentals, and cabins. Sunrise Park Resort offers skiing and winter recreation. The Hon-Dah Resort-Casino and Conference Center offers a casino, hotel, RV park, dining, and stores. Hunting is also available on the reservation. Because of the tribe's conservation practices, it is quite common to see wildlife on the reservation. Hawley Lake: Elevation: 8,500 feet. 125 campsites, drinking water, fishing, boating, RV Park, boat rentals, store, gas station. Horseshoe Lake: Elevation: 8,500 feet. 125 campsites, drinking water, fishing, boating. Reservation Lake: Elevation: 9,500 feet. 60 campsites, drinking water, fishing, boating, store, boat and cabin rentals. Sunrise Lake: Elevation: 9,000 feet. Camping, hotel, drinking water, fishing, boating (gas motors limited to 10 hp), RV Park, boat and cabin rentals, store, gas station. Sunrise Park Lodge: The 100-room lodge located on Sunrise Lake is available for winter and summer lodging. Offers dining, lounge, gift shop, indoor pool, whirlpool, and game room. Sunrise RV Park: 20 campsites with electric, but no water hookups. Sunrise Campground: 200 primitive campsites. No hookups or showers. Portable toilets, drinking water. Sunrise Park Resort Ski Area: Ski resort located near Sunrise Lake, centered around a cluster of three peaks, Sunrise Peak (Elevation: 10,700 ft.), Apache Peak (Elevation: 11,000 ft.) and Cyclone Circle (Elevation: 10,700 ft.). Offers greate family skiing with 65 ski runs (40% beginner, 40% intermediate, 20% advanced/expert) and 10 Total Lifts (3 Quad Chairs, 4 Triple Chairs, 1 Double Chairs, and 2 Surface Lifts) with an uphill capacity of 16,000 skiers per hour. Ski season: Usually runs from December to March. Night skiing also is offered in Mid-January and Mid-February. Sunrise Park Resort also has a snowboard terrain park and separate cross-country skiing area. Hon-Dah Resort-Casino and Conference Center: Offers a casino, hotel, RV park, dining, and stores. Hon-Dah Resort Hotel - Large rooms in this mountain lodge. 128 units on two stories, interior corridors. Heated outdoor pool, sauna, and whirlpool. Hon-Dah RV Park - Open year round, 258 sites, with restroom/showers, laundry room, recreation room, phone hookups, free Wi-Fi, satellite TV, RV supplies, LPG, and dump station. Pets welcome with prior approval (no pit bulls). Indian Pine Restaurant - This restaurant offers daily breakfast, lunch, and dinner buffets and a full menu of American and Native American food. Sunday Brunch is also served in the Timbers Lounge. Hon-Dah Ski and Outdoor Sport - Provides recreation information and sells permits, sporting goods, and clothing. 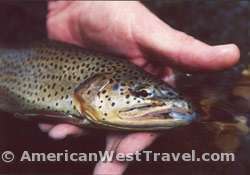 Also located on the reservation is the Alchesay and Williams Creek National Fish Hatchery Complex which raises five species of trout for stocking in Arizona, New Mexico, and Colorado. The hatchery is known for its role in the recovery of the threatened Apache trout, a rare trout native only to Arizona. White Mountain Apache Tribe Wildlife and Outdoor Recreation - Information on camping, fishing, and other outdoor recreation on the reservation. Reservation permits are required for all outdoor activities including fishing, hunting, camping, hiking, river rafting, sightseeing, picnicking, biking, and cross country skiing. Far from the hustle and bustle of Pinetop-Lakeside and the popular fishing holes of the White Mountains, secluded Hannagan Meadows in the Apache-Sitgreaves National Forest offers visitors the best of the Arizona high country experience: beautiful woods and meadows, plentiful wildlife, convenient fishing and hiking, and peace and quiet. At an elevation of 9,100 feet, you will find some of Arizona's coolest weather, a wonderful summer respite for desert dwellers. 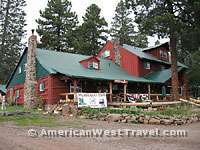 The historic Hannagan Meadow Lodge provides rustic comfort in this beautiful and remote corner of Arizona's White Mountains. Winter recreation is also available at Hannagan Meadows. There is trailhead access to the Blue Range Primitive Area, more commonly known as the Blue, one of America's most remote and unspoiled wildernesses. Located on US-191, about 45 miles south of Springerville. Blue Range Primitive Area - Alpine Ranger District (Apache-Sitgreaves National Forests) - listing of trails within the Blue Range Primitive Area. 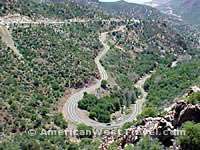 The Coronado Trail Scenic Byway is an adventure of switchbacks (nearly 400), steep grades, and hairpin turns and is known as one of the best scenic driving roads in the nation. The route, US-191, runs through the Apache-Sitgreaves National Forest between the towns of Springerville and Morenci. Travel is generally north to south in order to go downhill on the many switchbacks. The route starts in the remote eastern half of the White Mountains, runs through Hannagan Meadows (see above), then soon starts dropping from alpine forests back down to the desert. The route passes by the immense Morenci copper pit where there is a vista point for this surreal sight. The Coronado Trail is especially scenic in the early autumn when the roadside aspens turn beautiful colors. The trail is named for Spanish explorer, Francisco Vasquez de Coronado, whose 1540 route of exploration ran close to this scenic byway.